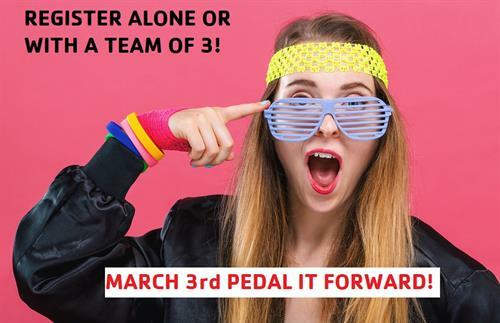 Pedal It Forward- "Pedal Through the Decades"
$50 entry fee per bike, additional $10/teammate. Receive extra raffle ticket for every $50 dollar pledge raised! We pedal for a great cause! 2-hour Pedal It Forward indoor cycling fundraiser. Ride as an individual or with a team. Come for the physical challenge and know that your dollars are building confidence in area kids through youth scholarships, funding LIVESTRONG at the YMCA and helping area families to experience healthier lifestyles at the YMCA. Are you Born to Run? Alright Now and Dream On! We’ll ride and groove to hits of the 70s. Walk on Sunshine, have a Celebration ride along to the rad music of the 1980s. We’ll be Living La Vida Loca in our Gym. Jump Around with some Good Vibrations and hits of the 90s.